Gotham will offer VIOLET Open Plays weekly at the Lab School, located on 17th Street. Registration is located on this web page, and opens each preceding Friday at 12:00 noon. Once registration opens, a section will appear asking some basic information along with a PayPal “Buy Now” button. 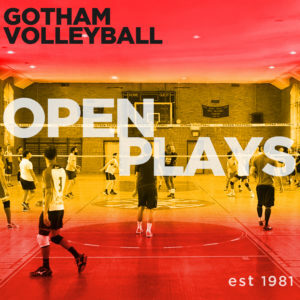 IMPORTANT: Please go to the OPEN PLAY menu in the above red banner and select “About Open Play” for more information on open play schedules, formats, eligibility, and registration rules & procedures. Mixed Open Plays will be offered at the beginning of each month. Schedule and info located here for more details. If you would like the join the WAIT LIST, please provide the following information and click submit. *Standard text message and/or data rates apply. This list is manually maintained. Please allow some time for your name to appear (only the first 8 are displayed). We are excited to continue offering this great new option for Open Play to PowerPlay Players on Saturday mornings. With 6 Divisions playing on Saturday, this gives our PowerPlay’ers some Saturday court time, too! It is not a coached activity, but upper Division Gotham leaders will help run this Open Play, offering some tips and pointers along the way, including education on how to referee the games. Afterwards, stick around to watch Division 5 play! Registration is now open for the SATURDAY April 27th PowerPlay Open Play, 9:30 AM at Howe. Are you current in PowerPlay? • The “Player Name” will be obtained from the PayPal transaction. If for any reason you need to register a player other than yourself, please FIRST email [email protected] for help. If you are registering via a business account, we will reach out if we are unable to resolve the player name.